Origami folding instructions are often written with the assumption the folder knows a particular type of fold. Learning the most common ones will make creating complex figures easy, as you will be familiar with the folds and terminology. Make a book fold by simply folding the left side of the origami paper onto the right, lining up the edges before creasing. The fold will open and close like a book. A valley fold creates a crease by folding the topside of the paper onto itself. When laid out, the crease line causes the sides of the paper to puff up above the folded line. The valley fold is represented in diagrams by dashes. The mountain fold is the opposite of the valley fold. To create the mountain fold, the top of the paper is folded down instead of up. Laid out, the crease has a peak in the middle. The representation for a mountain fold in diagrams is a series of dashes and dots. Dots may be singular or in pairs. The accordion fold is also known as the pleat fold. To make a pleat fold, alternate mountain and valley folds. Fans and leaves often incorporate accordion folds. Make a squash fold by opening up two layers of paper from a shared central point. The top figure is a squash fold in a waterbomb base, while the bottom figure is made with a book fold. To make a squash fold similar to the bottom figure, start by making a book fold. Next, make a location crease at the vertical midpoint and unfold. Fold the bottom of the paper up to the location crease and crease. Use your finger to open up the top layer you just made, flattening out the paper as you do so. The top of the fold will spread out, while the insides show their color. Crease the new fold lines. An inside reverse fold, sometimes called a pocket fold, is often used in making animals. To make an inside reverse fold, start with a kite base (top figure). Fold the base in half. Crease the front part of the figure upwards at an angle of your choice (bottom figure). Then open the figure back to the kite base, rotating the figure 180 degrees. Fold the top of the paper down so that only the top part is flat (top figure). Slide the index finger of your right hand into the crevice where the flat part meets the back end, as shown by the arrow in the top figure. Gently push the paper upwards, reversing the creases as the paper flattens. Crease the final folds when your figure looks like the bottom figure in the slide. The outside reverse fold, sometimes called the hood fold, uses similar techniques to the inside reverse fold. Start with a kite base (top figure), folded in half. Form a crease at a downward angle (bottom figure). Open the base to the original kite figure and turn it upside down. The top of the angled crease is a valley crease, but the bottom crease is a mountain crease. Put your right thumb at the outside corner of the mountain crease and your index finger at the outside point of the valley crease. Push forward until your figure looks like the top figure in the photo. Crease the bottom portion to reverse the mountain fold into a valley fold. Continue to push the paper forward, bringing your fingers and the paper together. Slide your fingers up to the point of the figure, reversing the original diagonal crease. Flatten all the creases (bottom figure). 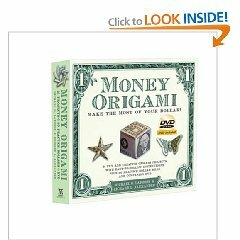 Knowledge of origami folding instructions are helpful when making origami boxes, animals, hearts, and other figures. You will avoid having to refer back to another source in order to continue the figure. Mastering the basics makes the transition to complex figures go smoothly.